E3.series is a Windows-based, scalable, easy-to-learn system for the design of wiring and control systems, hydraulics and pneumatics. The out-of-the-box solution includes schematic (for circuit and fluid diagrams), cable (for advanced electrical and fluid design), panel (for cabinet and panel layout), and formboard (for 1:1 wiring harness manufacturing drawings). Integrated with MCAD, E3.series is a complete design engineering solution from concept through physical realization and manufacturing output. 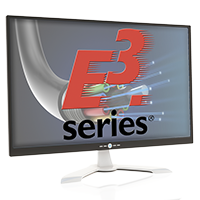 Test drive E3.series for free! E3.Viewer (Free) – E3.view is the free-of-charge viewer for E3.series. E3.Viewer allows you to distribute E3.series projects as original data. This ensures accurate exchange of data with production, service, suppliers and customers, while providing powerful E3.series functionality, e.g. Search, Jump, Device Properties. Copyright 2015 Tropical PCB Design Services Inc.